Club Penguin Cheats by Mimo777 Club Penguin Cheats by Mimo777: Club Penguin Weekly Field Op Number 11 Cheats! Step 6. Go to the Beach and into Lighthouse. Step 7. Go up to the speaker in the lower left corner. Your spy gadget light will turn green. 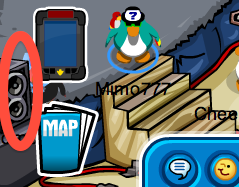 Also,theres a movie in the command room.If you get 10 penguins to sit in all of the chairs,a movie will pop up!Pretty Awesome!Also theres new gear! I have the new hair! omg new video in command room. it shows new epf HQ entrances coming soon! The Command Room was awesome. Nice change. It was still an old Field Op though. Hey, you can change the Command Room TV like you used to before the the room changed. Try it. Mimo That thing in the command room was awesome!remember me? "I SAW YOUR TWITTER AT THIRTY TWO SECONDS!" i saw me santa too! That was awesome! I got so exited when i saw u! wow lots of things from the old command room are back! I have never done a field op. I just sdon't understand them. Really easy thanks to you Mimo! There really easy to do! 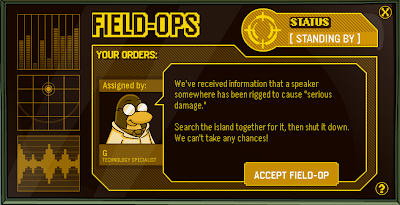 once you accept the field op and find the location of whats going on, you have a puzzle type mini game to do! once you complete it you will be rewarded!